© 2016 The Korean Society of Traumatology. Received June 28, 2016; Revised July 5, 2016; Accepted August 16, 2016. Non-surgical traumatic chylothorax following blunt chest trauma is rare, with only a few cases having been reported. In general, conservative treatment measures are recommended as initial management of traumatic chylothorax; these include closed thoracostomy, dietary restriction, and parenteral nutrition. There are few reports of surgery for traumatic chylothorax. We report our experience with thoracic duct ligation using video-assisted thoracoscopic surgery in a patient with chylothorax following blunt chest injury with associated fractures of the thoracic spine. Chylothorax is a type of pleural effusion caused by disruption or obstruction of the thoracic duct, resulting in leakage of chyle into the pleural space. The most common cause of non-traumatic chylothorax is malignancy, especially lymphoma. Chylothorax can also frequently result from direct injury of the thoracic duct during surgery. (1) However, blunt traumatic chylothorax-a case of which is reported here-is an extremely rare condition. A 50-year-old male construction worker was sent to the emergency department of another hospital following a fall from a height of three meters; he had landed on his back, colliding with an iron frame. He developed paraplegia immediately after the accident. Imaging revealed he had sustained flexion-distraction injuries and incomplete cord injury at the level of the tenth and eleventh thoracic spinal vertebrae (T10 and T11) (Fig. 1). Linear fractures of the right fifth and sixth ribs and an associated hemothorax were also diagnosed. Closed thoracostomy was performed, but only a small amount of blood was drained. There were no other injuries to his vital organs including the brain, heart, lung, liver, and kidney. The patient was referred to our hospital three days after the trauma at the request of the patient and his family. On admission to our unit, the patient was being allowed to resume oral intake from the local hospital, following which the nature of the pleural fluid drained changed to a pink and milky appearance. The amount of fluid drained exceeded 700 ml per day, and pleural fluid triglyceride concentration was 103 mg/dL, which strongly supports the diagnosis of a chylothorax. On the fourth day after the accident, posterior spinal fusion from T10 to T12 was performed urgently to stabilize the spine and relieve the pressure on the spinal cord in accordance with the policy of the orthopedic surgeons. After the diagnosis of a chylothorax was made, the patient was kept nil-by-mouth and given total parenteral nutrition. However, in spite of proper conservative treatment, the amount of chest tube drainage was greater than 1 L per day for six days; hence, we decided to perform surgical exploration. After induction of general anesthesia with doublelumen endotracheal intubation, the patient was placed in the left lateral decubitus position. Two ports were placed through 10-mm incisions at the 8th intercostal space along the anterior axillary line and at the 10th intercostal space along the mid axillary line. The working port was placed at the 9th intercostal space along the mid axillary line. The right pleural cavity was thoroughly inspected after introducing a 10-mm 30° thoracoscope. We found that the parietal pleura at T10 level was more greasy and glistening than the superior mediastinal pleura. The parietal pleura was then incised medial to the azygos vein at T10 level. The thoracic duct was identified and noted to be ruptured with flow of chyle seen. Upon confirmation of leakage of chyle from the thoracic duct, it was ligated distally with two 5-mm clips between T11 and T12 level (Fig. 2). After duct ligation, cessation of chyle leakage was visually confirmed. A soft chest tube was placed posteriorly and inferiorly in the dependent position. On day 1 post surgery, the amount of chest tube drainage was 180 ml of clear, serous fluid; hence, oral intake was restarted with regular diet. Following reintroduction of regular diet, the chest-tube drainage remained below 300 ml for three days. The chest tube was then removed without any further postoperative complications. At the time of writing, the patient had been transferred to the department of rehabilitation to receive continuous and comprehensive rehabilitation services for his disabilities. Conservative treatment has an approximately 50 to 80 percent success rate in postoperative chylothorax, with higher success rates reported in patients with <500 mL/day pleural fluid drainage. (8) For patients with non-surgical traumatic chylothorax, conservative treatments are suggested initially rather than surgical exploration. However, surgery is recommended when the drainage persists for 2 weeks, or drainage volume exceeds 1 L per day for five or more days in spite of proper conservative treatment. (9) During the initial phase, our patient’s treatment was strictly limited to conservative measures including chest tube drainage and dietary restriction (nil-by-mouth) with total parenteral nutrition, but the chest tube drainage was greater than 1 L per day for six days. During the surgery, we found a few differences between our patient and patients with post-surgical traumatic chylothorax. In our case, it was very difficult to dissect the soft tissue and to identify the thoracic duct because of soft tissue edema and hematoma around the level of the fractured vertebral bodies. We performed meticulous dissection of the connective tissue medial to the azygos vein and finally located the ruptured thoracic duct. However, during the dissection, we encountered massive hemorrhage caused by inadvertent tearing of the intercostal artery at T10 level; fortunately, the intercostal tear was well controlled with 6-0 monofilament sutures. The authors suggest that more careful attention is required during surgery on patients with blunt traumatic chylothorax than on patients with chylothorax from other causes. A spinal chest computed tomographic scan reveal that the tear drop fracture of T10 body (arrow), and fracture of left upper body and posterior element of T11. (A) Operative view of the ruptured thoracic duct at the tenth thoracic vertebral level; arrow, ruptured thoracic duct (B) Operative view after thoracic duct ligation; arrow, thoracic duct ligation with metal clips; arrow head, suture ligation with monofilament for intercostal artery hemorrhage. Az: azygos vein, Di: diaphragm, Es: esophagus, Lu: lung. McWilliams A, and Gabbay E. Chylothorax occurring 23 years post-irradiation: literature review and management strategies. Respirology 2000;5:301-3. Nair SK, Petko M, and Hayward MP. Aetiology and management of chylothorax in adults. Eur J Cardiothorac Surg 2007;32:362-9. Doerr CH, Allen MS, Nichols FC, and Ryu JH. Etiology of chylothorax in 203 patients. Mayo Clin Proc 2005;80:867-70. 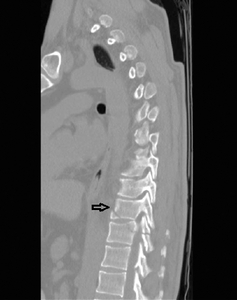 Sendama W, and Shipley M. Traumatic chylothorax: A case report and review. Respir Med Case Rep 2015;14:47-8. Serin-Ezer S, Oguzkurt P, Ince E, and Hicsonmez A. Bilateral chylothorax after blunt thoracic trauma: a case report. Turk J Pediatr 2009;51:504-6. Ikonomidis JS, Boulanger BR, and Brenneman FD. Chylothorax after blunt chest trauma: a report of 2 cases. Can J Surg 1997;40:135-8. Martucci N, Tracey M, and Rocco G. Postoperative chylothorax. Thoracic Surgery Clinics 2015;25:523-8. Takuwa T, Yoshida J, Ono S, Hishida T, Nishimura M, and Aokage K et al. Low-fat diet management strategy for chylothorax after pulmonary resection and lymph node dissection for primary lung cancer. J Thorac Cardiovasc Surg 2013;146:571-4. Maldonado F, Cartin-Ceba R, Hawkins FJ, and Ryu JH. Medical and surgical management of chylothorax and associated outcomes. Am J Med Sci 2010;339:314-8.